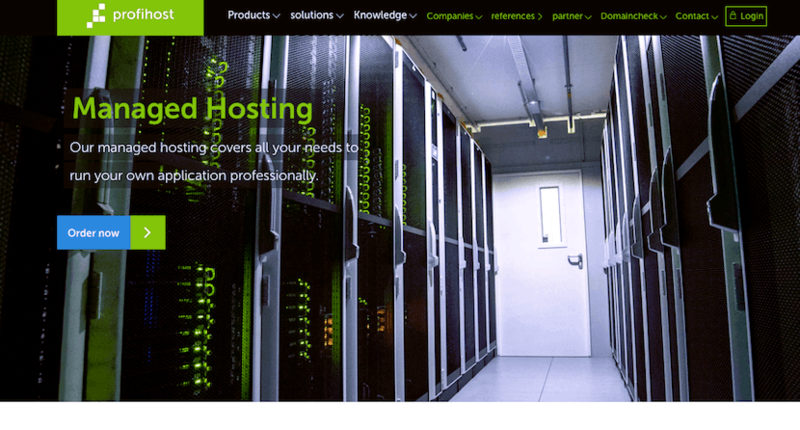 Profihost Review 2019: Is Profihost a Good Hosting? Profihost is a German-based hosting provider that has been in business since 1999. They focus primarily on managed hosting plans and have a staunch Made in Germany focus. Profihost are a proudly German hosting company. They’ve been in business since 1998, have almost fifty employees, and work with 15,000 clients. Their website is available in German. Profihost are very proud to be “made in Germany.” Their data center is located in Germany, uses 100% green energy, and meets German data protections laws, as well as the technical standards of the Federal Network Agency. So, customers can be reassured that their data is being handled in a way that meets strict German compliance laws. They don’t offer an uptime guarantee, however, they carry several certificates from industry organizations such as Alliance for Cybersecurity, Trusted Shops, Trusted Cloud, and Cloud Services Made in Germany, for the security and quality of their services. They only provide one package of managed cloud hosting, although they also offer managed servers, managed clusters, root servers, and root clusters. The Managed Cloud Hosting plan includes 50GB SSD storage (good news for disk read/write times), unlimited data transfer, unlimited domains, 500 email accounts, and 500 subdomains. Not only are they generous when it comes to the resource levels, they also provide a good range of features primarily suited towards advanced users and developers. They provide SSH access and Cron Jobs to ensure your website runs optimally, support for PHP versions 5 through 7.2, as well as Perl and Python. The plan comes with ten databases, MySQL and MariaDB, and phpMyAdmin. In terms of a managed hosting plan, the price offers very good value for money. The resource levels are high and they include plenty of value added features geared towards advanced website owners. It’s worth noting that domain registration is an added cost and there is a setup fee roughly equivalent to one month of hosting, while SSL certificates are included. You can purchase their shared hosting plans in one, three, and twelve month terms. However, there is no discount for purchasing a longer term. You can upgrade from a free Let’s Encrypt SSL certificate for an added cost during checkout. All plans come with a 30-day free trial. As they sell managed hosting, you’d expect them to have 24/7 customer service, so I was a little surprised to find that technical support is only available from Monday to Friday 8:00 a.m. to 6:00 p.m. They do have 24/7 monitoring of the hosting services however that’s pretty standard, even in unmanaged hosting plans. General support is available by telephone, email and, for traditional customers, fax, Monday through Friday from 8:00 a.m. to 6:00 p.m.
Profihost began life as a sole proprietorship in 1998 and has since scaled to 50,000 domains in 2007 and 100,000 by 2013. Along the way, they’ve won numerous business awards, gained industry certifications, and held true to their vision of a 100% made in Germany brand. Wondering how Profihost stacks up against other Web Hosting companies? Enter any other Web Hosting company and we will give you a side-by-side comparison.